There’s nothing worse than getting sick on vacation and there is nothing more stressful than the feeling of a cold starting before a big trip. A cold, flu or stomach issues can completely ruin a trip. There are so many great ways to stay healthy when traveling and I believe one of the most important is to build a strong immune system. 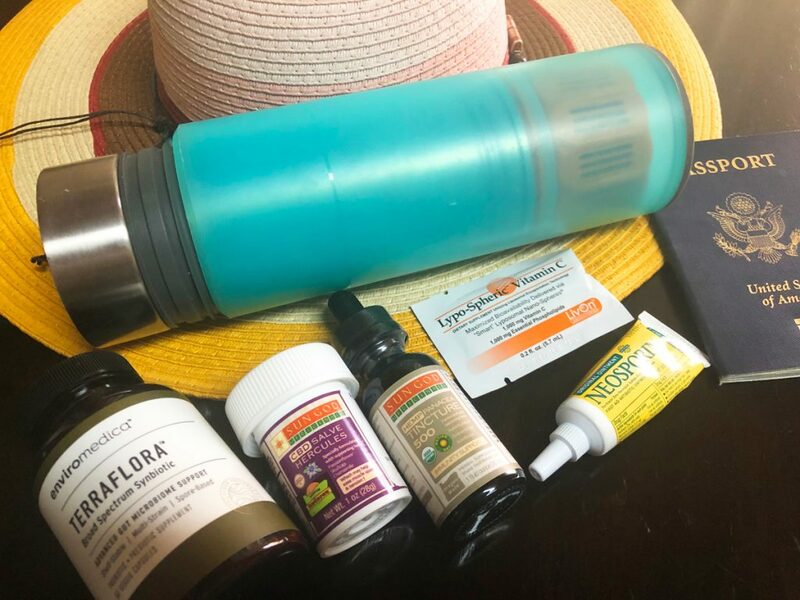 I start my immune boosting routine five to seven days before I leave for a trip to make sure I’m healthy before flying or starting a road-trip and stay healthy during my travels. If you want the most from your next travel adventure, try some of these tips to stay healthy when traveling. 1. Sleep. This may seem obvious, but the most important thing you can do while traveling is sleep. Your body needs rest from flights and train travel. While traveling can involve a lot of sitting, it is still stressful on the body to fly for hours on end. Crossing time zones, carrying luggage, walking, and sightseeing also take a lot out of you. Sleep as much as you can while flying, build in downtime to rest or nap on days that include a lot of sightseeing and set a reasonable time head to bed each night. The bottom line is that travel is taxing on your body, so make sure you get plenty of rest. 2. Hydrate. Carry a water bottle with you at all times and drink water throughout the day. Remember to increase your water intake if you are in a location that is hot or humid, you are walking for long periods and if you drink caffeinated or alcoholic beverages. Make sure the water is clean and safe to drink. Bad water is the #1 cause of dysentery, diarrhea and parasite infection around the world, so be careful and verify the water is purified. When I travel to India, Mexico or any third world country I bring a Grayl water bottle with the international travel filter. I’ve been using this water bottle for years. It removes pathogens (viruses, protozoa, bacteria) and filters particulates, heavy metals and chemicals. It’s simple to use; just fill the empty outer cup with water and then push the inner cup with the filter down (think French press). The bottles are BPA-free plastic. You can buy the Grayl Water Filtration bottle on Amazon. Note: Make sure ice is made from purified water before you add it to your drinks! Don’t do it unless you are completely sure. 3. Take a Probiotic. Not only can probiotics help your digestion on an everyday basis, but many also say they can help prevent and stop travelers’ diarrhea and boost your immune system overall. I use and recommend Terraflora Broad Spectrum Synbiotic probiotic. 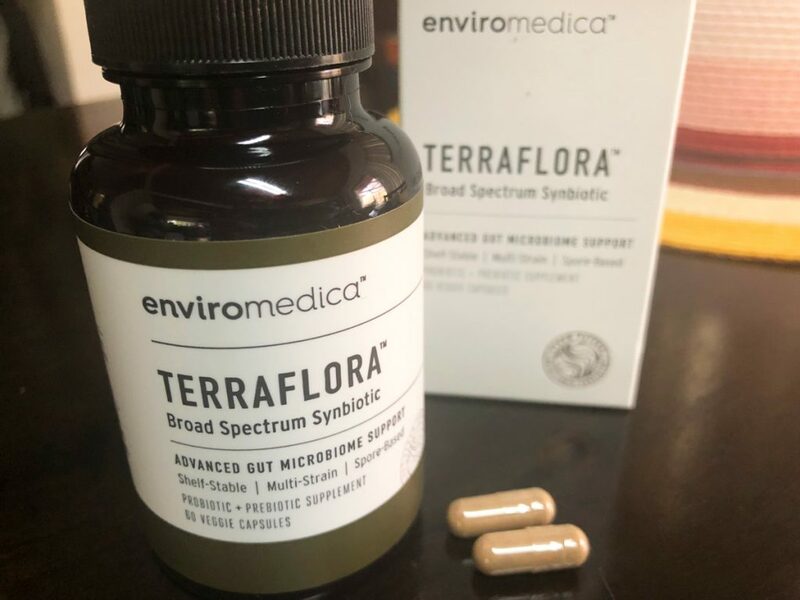 Terraflora has a built-in prebiotic, made from certified organic, wild-harvested, food-based ingredients. The Terraflora brand doesn’t require refrigeration, which makes it a perfect choice for travel. Why a Probiotic? The majority of your immune cells are in your gastrointestinal system. Probiotics contain “friendly” bacteria that can fight the “unfriendly” bacteria. According to the National Institute of Health, probiotics can help your body combat germs and kick your immune cells into a higher gear. Probiotics can help you stay regular even when the rest of your schedule is way off because of travel and time zones. Combine this with the fact that your immune system tends to be compromised while traveling, you’re now at potential risk of getting sick on your trip. Prebiotics are helpful in increasing the helpful bacteria already in the gut that reduce disease risk and improve general well being. Boosting your immune system is key. Staying healthy will help fight the times when you accidentally eat questionable food during travel. I take my probiotic regularly, but, if you’re looking to protect yourself just for an upcoming trip, Webmd.com suggests taking probiotics for at least one week before your trip, every day while traveling and to continue at least one week after you return. I’ve only ever taken the recommended dosage on the bottle and have found that to be fine for me. But you may want to talk to your doctor about the right dosage for you based on the type of trip you’ll be taking and your medical history. 4. Muscle Tension Salve. Traveling involves a lot of activities that can really test your muscles like flying, hiking, and even a long day of walking. 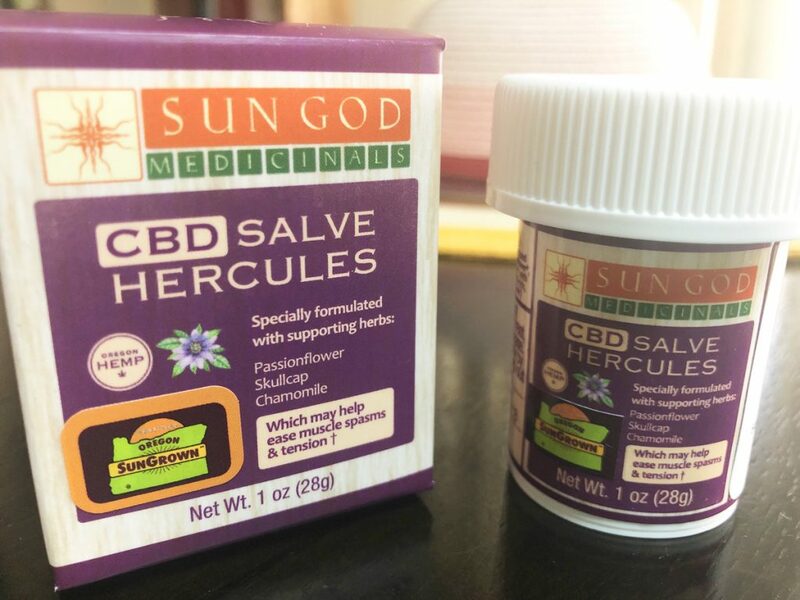 I recently found Organic Hercules Muscle Tension Hemp Salve by Sun God at the Expo West trade show. I was amazed at the amount of CBD and hemp products at the expo. It seems to be one of the fastest growing retail product categories and I have to admit my curiosity was peaked! The Sun God Medicinals CBD salve is an organic nutrient-dense, deep moisturizing product with passionflower, skullcap, and chamomile herbs along with Oregon whole hemp flower oil and is formulated to benefit sore and stiff muscles. The herbs included in the salve are ones traditionally used by herbalists to help relieve muscle tension and discomfort. Made with Oregon whole hemp flower oil and other certified organic herbs from Southern Oregon. This salve is formulated to include approximately 400mg of CBD naturally present in the Oregon-grown whole hemp flower infusion. I’ve got two back to back flights coming up and my legs tend to get stiff on long flights. I’m excited to use the salve and report back and let you know the benefits I experience! 5. 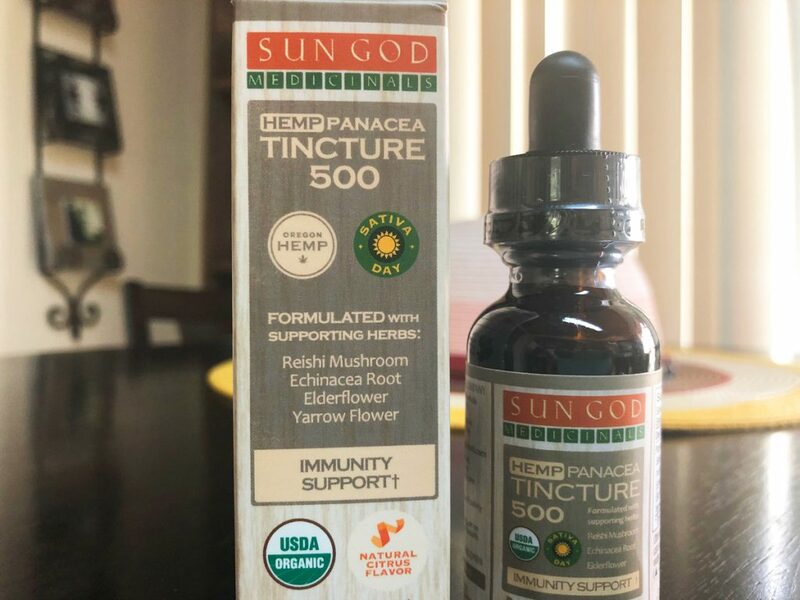 Immunity Support Tincture Another Sun God product I found at Expo West was the Organic Panacea Immune Support Hemp Tincture 500. Any time I see a product that benefits and strengthens the immune system (before, during and after traveling) I am on board. This is a certified organic hemp tincture formulated and compounded with supporting medicinal herbs traditionally used by herbalists to help the body maintain a balanced and strong immune system. Panacea was a goddess of healing by way of curative medicine in Greek mythology. The maintenance and promotion of health and wellness is the goal for healthy travel and building a strong immune system is key. I’m also interested in trying the tincture to see if I experience any calming or extra relaxation during the flight. 6. Protect Yourself from Germs. When flying, I always carry Neosporin, which is an antibiotic ointment. I rub a bit around my nose and ears at take-off to help prevent any germs circulating around the plane from getting me sick. 7. Boost Your Vitamin C Another of my top tips for healthy travel is taking Vitamin C. I start this about three to fives days before I’m flying. I use Lypo-Spheric Vitamin C because it is – designed to help your body absorb more vitamin C. Along with many of the above products it helps to help maintain a healthy immune system. I also love that these are in single packets and take up very little space when packing. There are so many great ways to stay healthy when traveling and I believe one of the most important is to build a strong immune system. The above tips and products are my go-to and what are included in my routine to stay healthy when I travel. I travel to Mexico quite often and when I visit, along with the above products I also bring grapefruit seed extract GSE. If my stomach starts to feel funny I put a few drops in filtered water and drink it. I also double up on my Terraflora probiotic. For my first trip to India, I decided to take it a step further based on a suggestion from the Passport Health Clinic and take a preventative supplement called Travelan. It is a dietary supplement high in antibodies that help prevent diarrhea. Simply take one pill before each meal. DiaResQ, is a backup for Travelan and if you do end up with travel diarrhea. It’s specifically made for travel and supposed to stop diarrhea with just two doses. I was told to take Imodium with the DiaResQ if I wasn’t able to stay in my hotel while it kicked in (for extra and immediate help). Enjoy your travels and stay healthy! Feel free to share your own tip in the comment section below! Disclaimer: I am not a doctor and this article is not meant to be taken as medical advice. 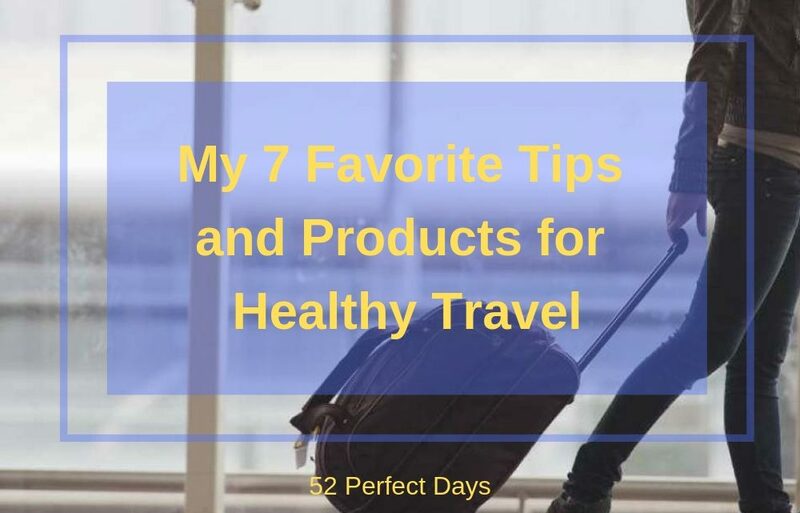 I’m merely sharing the ways I have found to help keep me healthy on my travels. You should consult with your personal doctor to see what’s right for you.